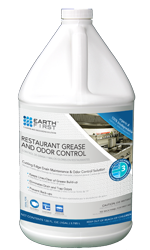 EF-001 Restaurant Grease and Odor Control is a breakthrough drain maintenance solution that works effectively to eliminate drain and trap odors, keep sewer lines clear and prevent grease related back-ups/overflows. Restaurant Grease and Odor Control is safe and effective in any environment including Restaurants, Grocery Stores, Hospitals and Hotels. The product should be applied at the end of daily operations when cleaning has been completed. Pour 6 ounces of Product into the provided measuring cup. This step will repeat with each application site. Apply Product directly into the corresponding number of drains. Pour one Gallon of STEAMING HOT WATER down each drain that received an application of Product. This will ensure Product will activate in a rapid manner, exposing your system to all of Product’s benefits. Restaurant Grease and Odor Control is safe, stable, non-corrosive, does not require special handling or training, and is not subject to spikes due to temperature or loading factors. Restaurant Grease and Odor Control is biodegradable and rapidly degrades in the open environment without loading solids into the effluent water. Restaurant Grease and Odor Control has no adverse impact on compliance with effluent discharge permits such as NPDES permits or compliance with local regulations in regard to discharge into the sanitary sewer systems.